Western Kenosha County Senior Citizens Council, a non-profit, seeks Senior Center Program Director for part-time weekdays and special events. Bachelor’s degree or experience in activity planning for older adults, in supervising volunteers and a desire to serve seniors required. Knowledge of wordprocessing, spread sheet and social media also needed. 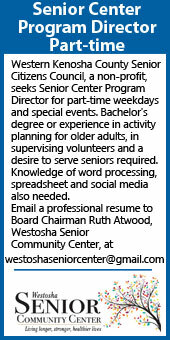 Email a professional resume to Board Chairman Ruth Atwood, Westosha Senior Community Center, at westoshaseniorcenter@gmail.com.